MyTrails can retrieve directions from point A to point B and display them as a new track. The start and end points can be manually defined by their coordinates, or they can be those of waypoints or the current GPS location. 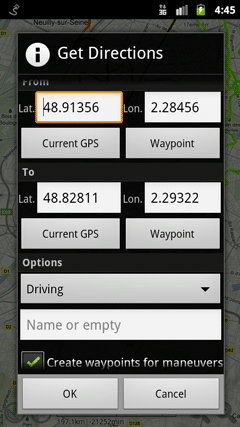 Directions can be optimized for walking, driving and in certain countries for bicycling. Once the directions are received from the online service, a new track corresponding to the itinerary is created, and for each manoever a waypoint may optionally be created, which includes the text description of the manoever. These tracks are saved as GPX, and can be manipulated like any other tracks (shown, hidden, forgotted, reloaded), so with a little forethought you can use directions while completely offline. If the map you are using is not Google, you may notice that the directions track is not exactly aligned with the map. This is because different map providers have slight differences that can be seen at high zoom levels. MyTrails is not a Voice Navigation application: it simply offers a basic way to see the path you may want to take to travel from one location to another. It does not have the vector map data that would allow it to correct errors in the GPS location (snapping), it does not offer re-routing, it does not dynamically display navigation instructions, and it doesn’t really try to be very smart about directions. Despite the warning in the previous section, MyTrails borrows one feature from Voice Navigation apps: proximity notifications. When you’re getting close to a waypoint, MyTrails will warn you with a selectable combination of vibration, ring and spoken information. This is not restricted to waypoints associated with directions, but works for all waypoints, so you can plan a few turns ahead on a trail that only you know about, and you will get the warning. The distance at which the notification is triggered adapts to your current speed: for highway speeds, it’s about 1km (or mile); for slower roads, 500m; for city driving or biking speeds, 200m; for walking speed, 50m. Getting back to the previous warning: MyTrails doesn’t try to be smart with notifications, and it doesn’t care about the sequence of manoevers in a direction track, so despite our best efforts, the wrong notification could be given; make sure you always double-check, and don’t drive into a ditch or jump off a cliff. This entry was posted in and tagged manual on 17 April 2012 by frogsparks.